Yes it is in the shops!! And like me many of you have seen the previews and the MBK packt aus. But there is already a building review on the WEB that I want to show to you from Nigel’s Moddeling Bench please take a look at this Link. He shows in to the details, the build of this great TAKOM model. This is also the start page of my building review of the kran, but the real start will be in atumm of this year. The reason is that I have some othere models with more priority to be build for the next couple of months. As usually it will be a V-2 related item including the special beam for lifting the V2 rocket from the Vidal to the Meillerwagen but that one is still on my drawing board for the last updates. Hope you all can wait for the start, in between I will use this as the page to publish any update or new information on the Takom Fries kran that I can find. Fries kran book of Volker Ruff. Well I did promise you all to keep posted om the development's around the Fries crane. Did find a nice link on Missing Lynx a comparison link between the Amusing hobby and the TAKOM version. When I inspect both I see a lot of missing fine details on the AM model, for the T crane a lot of fine details. Some peole say that they hate the rubber tyres from the TAKOM models but, oops !! when looking at the AM tyres. A other point to comparis are the chain connections of the hoist dolly from very havy of the AM model to the fragile connections of the Takom model. But maybe it is better to judge that for your self, but it may be clear witch model I would prefer building. Please take a look for your self and judge between those two, the sand coloured one is the Amusing Hobby, grey is TAKOM. Well the Fries crane is in the news, found "two out of the box" reviews on the model one from Amusing hobby and the Takom version by MBK. If you go for a "cheap" crane take a good look at the AM version, are you going for more detail and the possibility to make the crane also in transport mode the Takom is the one for you some more money but also more detail-parts. YES Takom's New version of the crane is comming !!! Will start with the building review and updates as soon as posible, can not wait untill it is on my workbench. Sorry have two pictures but no rights to place them here. Es ist die 1944/45 Version des Strabokrans, also eine abgespeckte Variante. ich meinte, er ist vom Getriebe her vereinfacht worden, denn er hat nur noch eine Steuerkette. Die Laufkatze ist auch eine andere. Take a look at the following link to see on of the first ready build Fries cranes at Missing Lynx. When in January this year the Fries crane version ’43/‘ 44 came on the market I did not start with that model at all. 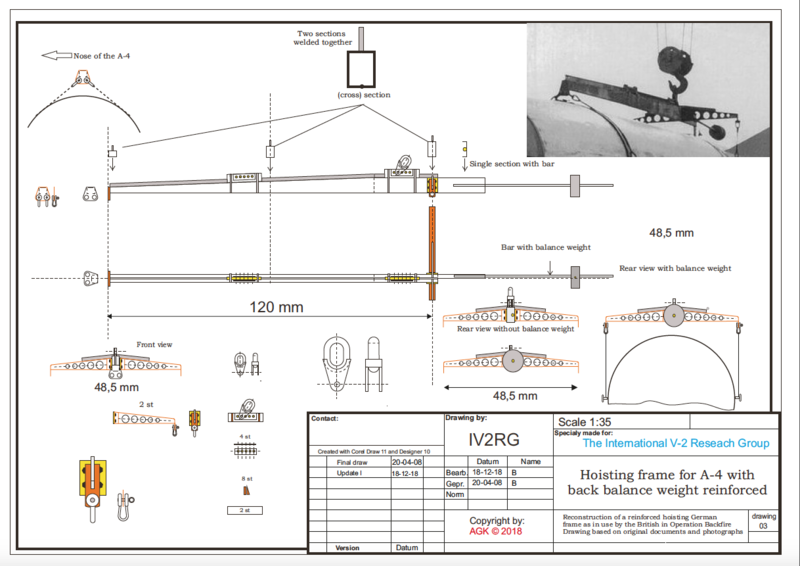 I could have done that and scratching the parts needed for a V-2 ’44/’45 version, but at that moment a little bird told me don't start, Takom is working on a V-2 version of the crane including the hoisting beam. So now almost four months further in time, you can make a pre order on one of the two combination boxes of the Fries. I did order mine by my Dutch local model store " ROBImodelbouw "
At the Lingen EME Euro Model Expo 2019 the leading expert on the Frieskran did a survey on both of of the cranes from Ammusing Hobby and the Takom. His conclusion is that the Ammusing is a far more simplified version of the crane, and has not the detailing that the Takom has to offer. The French Azimut has under the number V2AZI10074, the special V-2 Hoist beam available in there collection of V-2 items. I hope they also will make a resin wheel-set for the Fries, like they have done for the Meillerwagen, Hanomag SS-100 and the Vidalwagen. So now I’m waiting on my Fries crane ’44/’45, in the mean time I will complete some other models that are on my work bench. The Sd Kfz 6-3 “Diana” from Bronco and a Sd Kfz 254 both in the colours of the Africa corps. TAKOM 2088 "M31 US Tank Recovery Vehicle"